It starts at 9.30 am and includes the preparation of a multi-course lunch, that you will enjoy with our wine at the end of the lesson. 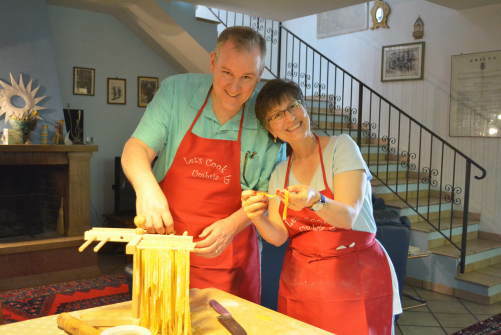 Our Half Day cooking lesson is the best way to immerse yourself in the lifestyle and traditions of Umbria learning to cook authentic Italian recipes in an informal and friendly environment. It is for people who want to dedicate a full day to the Italian food and the culinary treasures of Umbria. It includes cookery class and lunch in the morning and gourmet tour in the afternoon ( wine, olive oil, truffle, ceramic, chocolate). This is a great way to indulge yourself with good taste, while exploring this great region of Umbria.